The main argument for hiking the Social Security retirement age—which amounts to an across-the-board benefit cut of about 7 percent for each year it is raised—is that average life spans are increasing. But longevity improvements are highly concentrated among upper-income and well-educated Americans. Over the past twenty five years, life expectancy at age 65 has increased by just one year for lower-income men, compared to five years for upper-income men. 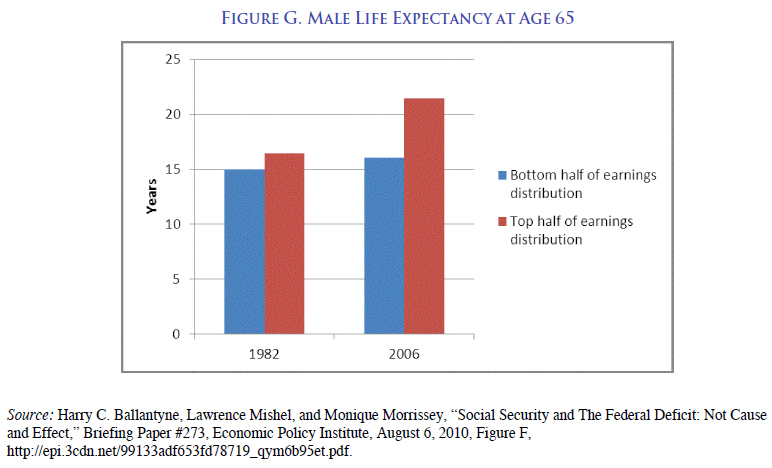 As the graph below shows, men in the bottom half of the earnings distribution have shorter life expectancies today than men in the top half had back in 1982. For women in the bottom half of the earnings distribution, life expectancies actually have declined over the same period. Reducing benefits for everyone on the basis of longevity improvements for only the most prosperous Americans would be an inequitable and poorly reasoned policy response.